On November 16, 1532, (475 years ago this year) Francisco Pizarro with only 168 soldiers, launched a surprise attack against against the Inca king, Atahuallpa, and his tribal commanders from within the city of Cajamarca. Though the city was defended by as many as 80,000 soldiers, Pizarro was victorious. The Spanish force used cavalry charges and volleys of muskets from behind cover. The Inca had encountered neither horses nor guns before. 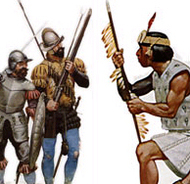 (Also, the Spanish wore steel armor, but the Inca had only slight leather armor.) The Spanish attack destroyed the command structure of the Inca. Thus were both the king and the city of Cajamarca able to be captured by so few men. Pizarro, against his word, had the king executed 8 months later after a ransom had been paid for the monarch. The ransom of gold and silver was enough to fill the so-called "ransom room," which was 22' x 17', and 8' tall. Nova aired an episode about the new light that research in Peru is shedding on the tale of the Inca empire's downfall. Very good summary. Just what I needed. Most books or websites drag it out or over complicate it. This was perfect.